Hi! 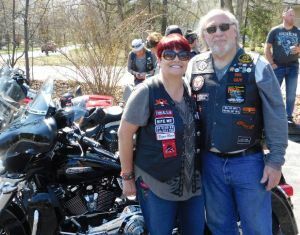 I’m Barb Wilson, aka “Red.” I am a motorcycle-riding newbie, and proud of it. My hubby Rick (aka “Big Guy”) and I are the proud owners of a 2017 HD Tri Glide Ultra, in Vivid Black. Big Guy owned several motorcycles before our purchase; his newest goal is to convince me that wind therapy is a necessity in my life. Lucky for him, I couldn’t agree more. In addition, I bought several dead cows’ worth of leather—in the form of vests, chaps, jackets, and gloves—to extend the riding season as long as possible, along with a sturdy helmet, and a well-made pair of boots. And of course, some really cute T-shirts full of bling. If it has rhinestones, it’s in my closet. Second issue: when I need a bio break, we STOP. No discussion, no arguments; as soon as the next available restroom-equipped facility appears on the side of the highway, we are aiming toward it in a straight line. Of course, me being a newbie, there is really only one place to go in 2018; and that is the Sturgis Rally. We’ve got our reservations made, our route plotted, and we plan on contributing positively—smiles/hugs for all our new friends, and lots of eating and shopping. Woo hoo! We were fortunate to meet Jerry Cole, Director of the Sturgis® Motorcycle Rally™ at the Chicago International Motorcycle Show, and he invited me to share our stories with his readers. Please consider this our introduction, with updates every so often on our preparations—along with the juicy details on our triking adventures. Once we hit Sturgis in August, keep an eye out for us (we’re hard to miss!). Please don’t be afraid to come up and introduce yourself. You just might get mentioned in a column. Budgeting for a Good Time! Decisions, Decisions, Decisions... How Did We Decide on Sturgis?